The Ptolemaic system, from 'Margarita Philosophica', 1535. 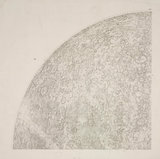 Moon drawing by Galileo, c 1610. Total solar eclipse, 29 May 1919. British Transit of Venus Expedition, Station D, 1874. First photograph of a sunspot, 2nd April 1846. Ring galaxy AM 0644-741, 2005. Callisto, one of Jupiter's moons, 1979. The Andromeda Galaxy, August 2004.